Following a residency at CERN in Switzerland, Su Wen-Chi was inspired by the similarities that both the arts and sciences shared in their approach to research and conceptual thinking. 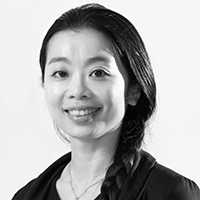 In this workshop, Su Wen-Chi will share her experiences being artist-in-residence at the largest particle physics laboratory in the world and the experimental processes she uses to translate scientific thought into choreographic form. Workshop participants will be guided through sets of physical exercise which will help them grasp the principals of quantum physics (like on the density of space, dividing things half and half). The session will wrap with a debrief and discussion. Participants are required to use their own mobile phones and earphones in this workshop. Selected participants are strongly encouraged to attend the ADN Conference 2019 on 25 & 26 May 2019, especially the panel on "Dramaturgy and Technology" on the second day, featuring practitioners Martyn Coutts (Australia), Su Wen-Chi (Taiwan) and Jompet Kuswidananto (Indonesia). Work full-time and freelance in dance, theatre, visual and/or new media arts. Enjoy movement improvisation, although dance training is not necessary. Are 21 years old and above. A brief introduction of yourself and why you want to participate in this workshop. A brief description of a project you are currently undertaking or plan to undertake, that involves performance and technology. Selected applicants will be notified by email on 10 May 2019. Su Wen-Chi is a dancer, choreographer and new media artist working in Taiwan, currently the Artist-in-Residence of the National Performing Arts Center - National Theater & Concert Hall, Taiwan R.O.C. In 2005, Su founded YiLab. in Taiwan, an experimental group of new media and performance artists working on integrating new technology with the performing arts, and seeking to present new performing formats. YiLab.’s philosophy is: in a work, there is not just one dominant medium, only concepts that appear similar but collide with one another; every artist involved is an independent entity who can freely put forward their viewpoint and undertake in-depth exploration of the core significance of the theme. Find our more at suwenchi.com.